Run asynchronous standup meetings in Slack! Enjoy the benefit of data driven decisions. Keep your whole team in the loop and allow effective leadership to flourish. Maintaining an aligned and well organised team is not an easy task. With Geekbot reporting just happens. Geekbot is built into Slack, one of the most popular communication platforms. That is why it's so easy to use right out of the box. Access everything in one place. Create or edit your standups and view the progress of your team's meetings. 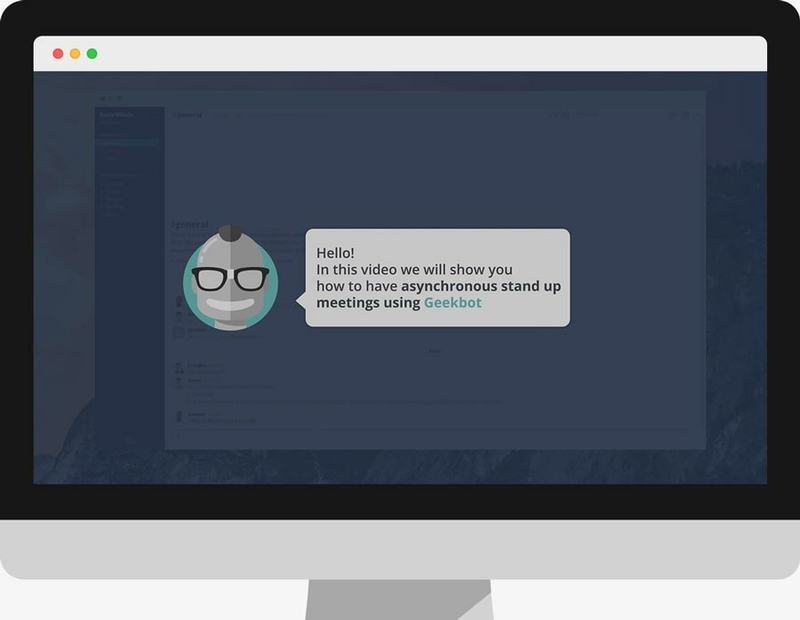 Geekbot seamlessly creates a standup meeting with the members of your team. All you have to do is answer a set of questions that the bot then posts to a channel. This allows for a non intrusive process that helps your team stay focused on the real tasks. Take a quick look at how it actually works as a daily process. Wrestling a complex project often means that various tasks are assigned to multiple departments. Each department needs to have its own timeline. Multiple standups helps you break down the information and keep the noise to a minimum. A sales team doesn’t necessarily need to answer to the same set of questions as a design team. Adjust the questions of each of your standups to better fit your team. Even set the mood for Geekbot by giving it a casual or more serious tone. Interact with Geekbot and tell it what you need! For now Geekbot can understand simple commands like dashboard, report, pause etc. You can find a complete list of commands here. Access everything in one place. The dashboard is where you can create or edit your standups and view the progress of your team’s meetings in a timeline. All members that are invited to a standup can view the reports. You can choose who has privileges to edit a standup and who will be limited to only report. Don't forget you can broadcast in private channels with specific members. Sometimes privacy matters. You don’t have to worry about who reported in your standup. Geekbot will remind your team members at the given time you’ve configured. Easily download your standup data using the “Download CSV” button in your dashboard. Also assume total control over your data using our API and integrate it with your favourite tools. Morning stand-ups with @geekbot_io and @SlackHQ are awesome. More flexible than daily, face-to-face check-ins. Thrilled about @geekbot_io and their support of nonprofits like @brandworkers. Helps our team move with urgency, align, and be accountable. @geekbot_io geekbot rulez!It saves us so much time! Configuration makes it possible to adapt it perfectly to our business needs!Great work! Tried out @geekbot_io this morning. Integrated with @SlackHQ in 60s, does standup async. Really cool. We automate our standups (staff checkins) with @geekbot_io! ALL ORGANIZATIONS THAT USE SLACK MUST CHECKOUT THIS PRODUCTIVITY TOOL! Do you have an awesome idea for a feature? Just hit the feature request button and tweet us your idea! Begin with your Geekbot now! Boost your team's productivity, it only takes a minute to set up. Our service is compliant with Credit Card Security Standards and PCI-DSS approved.